Beautiful set up from Conway, and what a shot! Well held in the centre, nudged to Michaels, who just gets to it, once, twice, and its out! I imagine the commentator’s voice in my head as the game continues. We’re playing my new favourite sport - noodle ball. You probably haven’t seen it on television but if you work in a care home you may have come across it and its positive value for people living with dementia. My name is Charlotte and I'm currently on a 5 month placement with Anchor based in Greenacres residential homes learning about flexible, imaginative and accessible activities. Many people enjoy sports of different sorts through their lives, whether it’s netball at school, a weekly football game or a lawn bowls career. Several residents I’ve chatted to have said they miss sport and wish they could continue earlier hobbies like football, hockey or tennis. 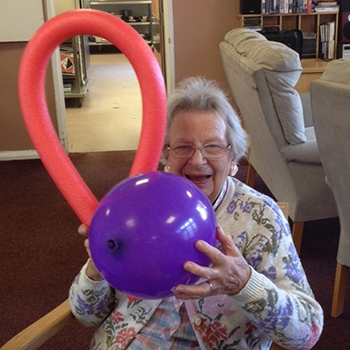 Noodle ball has some advantages over these in the care home environment - it is fairly low risk and easily accessible to people with mobility or balance difficulties. It is also a good group activity for people living with all levels of dementia, because it requires minimal understanding of immediate context to take part. But let me explain how it works. Like all the greatest sports it is essentially simple. Players sit in a rough circle and each one has a standard swimming pool noodle, which they use to hit a balloon. Beyond that there are no rules and only a very general aim - keep the balloon in play and have as much fun as you can while doing it! Most groups choose to play noodle ball collaboratively, applauding long rallies and elegant shots that keep the balloon in the playing area. There is ample room for skill and individual technique, and I find the satisfaction of a well-played shot is as great in a noodle ball circle as any sport I’ve tried over the years. There is real range and creativity in the shots and techniques that residents at our home develop to suit their own particular style of play. One of the fascinating things about the game is how different groups adapt to playing it. When we play in the main lounge in a large circle it can get quite fast and exciting, with people pushing themselves half up on their frames to reach a particularly high lob. There is also a lot of laughter created in the process, especially when the balloon manages to float gently down onto someone’s head while they are looking around for it. It’s a completely different atmosphere when we play it up on Daisy Unit. There the pace is more genteel and the balloon dances around as if in slow motion between the comfortable arm chairs, or bounces between frames as we all try to perfect our technique for picking it up with two ends of a noodle. I am particularly fascinated by the willingness of residents to join in with it, and there is a wonderful joy in watching a practically non-verbal lady enjoy the satisfying ‘plop’ of balloon on polystyrene as she bounces it up and down before directing it to her smiling neighbour. Charlotte Whittaker is on a 5 month placement with Anchor based in Greenacres and Orchard Court residential homes. 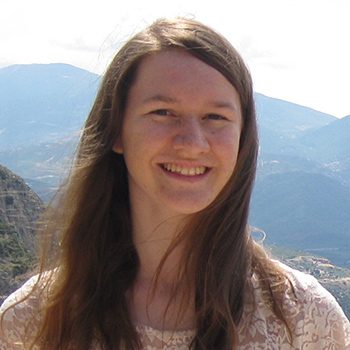 Charlotte is studying on the Year Here programme in social innovation and currently enjoying learning about providing flexible, imaginative and accessible activities in residential settings.